Australian Prime Minister Julia Gillard says as many as 48 asylum seekers may have been killed when their boat sank last week off Christmas Island. 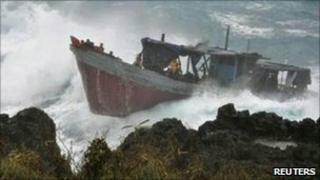 So far 30 bodies have been recovered after the boat hit rocks and broke apart in stormy seas on Wednesday. Officials have been talking to the 42 survivors to try to determine how many more people may still be missing. Ms Gillard said around 90 people were now thought to have been on the boat, but some bodies might not be recovered. "We may never know the precise number, but the advice to me is that the best estimate at present is that there were around 90 people on the boat," she said. "That does mean of course that we are still not able to account for around 18 people." The passengers of the flimsy wooden boat are believed to have been Iranian, Iraqi and Kurdish asylum seekers making their way to Australia via Indonesia. Christmas Island lies in the Indian Ocean about 2,600km (1,600 miles) from the Australian mainland, but only 300km south of Indonesia.